The National Pensioners Convention (NPC) made the plea after the star's latest music video Candy, in which he is seen punching an elderly woman. Talk show host Graham Norton asked him on his show: "That's quite a shocking image isn't it?" 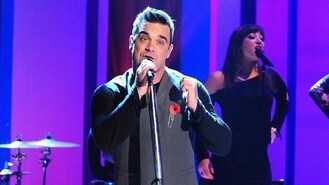 To which Robbie replied: "It is, isn't it. They wanted me to kick a dog and I'm an animal lover, so I was just not having that. Then they said 'punch a pensioner' and I was like, 'Yeah, I'm in'." The NPC has now called for the BBC to issue an apology, after television regulatory body Ofcom said they had received one complaint over the incident. Dot Gibson, NPC general secretary said: "Celebrities should think twice before making ageist comments which seem to imply that pensioners should be treated in a degrading way. "Elder abuse is a serious issue and needs to be tackled rather than seen as a bit of a joke. We need to be uniting the generations, not suggesting that they are different. Pensioners are just young people who grew older." Neil Duncan-Jordan, National Officer of the organisation said: "A number of our members have complained to us about the comment, hence our decision to respond. The remark has to be taken in the context of where we are today, with the almost weekly reports of elder abuse. "There are certain things now which are so important and have ridden up the political agenda, and this needs to be taken seriously. It's all about the context in which it was used; the phrase was probably ironic, but it just gives the wrong impression that animals are to be treated with greater respect than older people."